Being born during a hurricane is unlucky, and twelve-year-old Caroline has had her share of bad luck lately. She's hated and bullied by everyone in her small school on St. Thomas of the US Virgin Islands, a spirit only she can see won't stop following her, and -- worst of all -- Caroline's mother left home one day and never came back. But when a new student named Kalinda arrives, Caroline's luck begins to turn around. Kalinda, a solemn girl from Barbados with a special smile for everyone, becomes Caroline's first and only friend -- and the person for whom Caroline has begun to develop a crush. Now, Caroline must find the strength to confront her feelings for Kalinda, brave the spirit stalking her through the islands, and face the reason her mother abandoned her. Together, Caroline and Kalinda must set out in a hurricane to find Caroline's missing mother -- before Caroline loses her forever. Born and raised on St. Thomas of the US Virgin Islands, Kheryn Callender holds a BA from Sarah Lawrence College, where they studied fine arts, Japanese, and creative writing, as well as an MFA from The New School’s Writing for Children program. 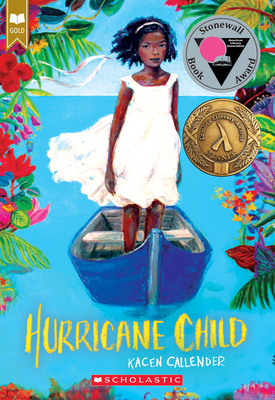 Hurricane Child marks their debut novel.